Although it is criticized for being slow, the Air Force is accelerating the pace of innovation, Secretary Heather Wilson said. 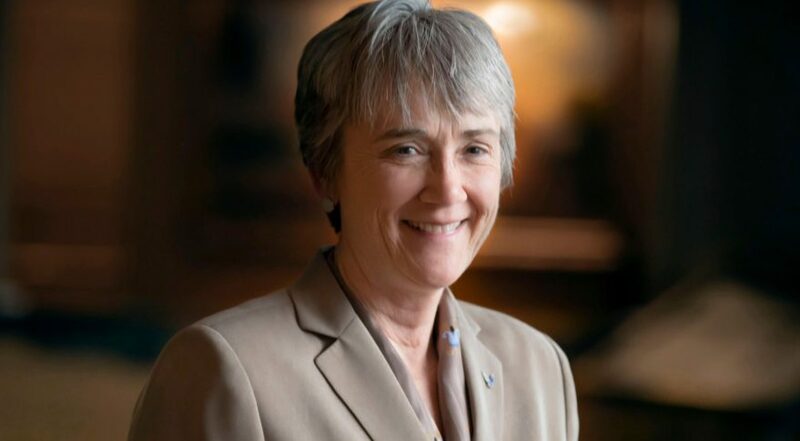 COLORADO SPRINGS — Air Force Secretary Heather Wilson did not want to directly respond to the jabs lobbed at the service for the slow pace of space acquisitions. “We’re moving much faster, we’re stripping years out of acquisitions,” she told SpaceNews on Tuesday. In her final weeks as Secretary of the Air Force — Wilson will be stepping down May 31 to become president of the University of Texas El Paso — she continues to defend the Air Force’s record on space procurements even as the Pentagon plans to turn over responsibilities for developing the next generation of space systems to a new agency. Wilson cited a number of efforts the Air Force is pursuing to speed up innovation. “It’s not enough to say ‘make the system go faster,’” she said. “You have to change something.” The Air Force Space and Missile Systems Center is being reorganized so there are fewer layers of reviews and approvals, she said. SMC started a space industry consortium to work more closely with startups. Wilson has delegated authorities down the chain of command so people can focus on managing programs rather than dealing with the Pentagon. None of that has stopped a year-long effort led by Shanahan and Undersecretary of Defense for Research and Engineering Mike Griffin to create a new space agency to speed up innovation and develop the next generation of military space systems. The Space Development Agency promises to disrupt the military space business by bringing more commercial technology into military systems, and its first project will be to design a constellation of low-cost satellites in low Earth orbit that would be adapted for military missions. When the idea of the SDA was first floated last fall, Wilson pushed back to no avail. On Tuesday, in her keynote speech at the Space Symposium, Wilson openly challenged the new agency’s vision to to develop commercial LEO constellations for military missions. In the interview, she continued to voice skepticism about the SDA and about its enthusiasm for low-cost satellites in LEO. “The first project that the Space Development Agency is going to take on is actually an Air Force project that we have funded in our budget and done in partnership with the Defense Advanced Research Projects Agency,” Wilson said, referring to DARPA’s Blackjack project to develop a LEO constellation. Wilson is not opposed to using commercial LEO constellations, but models and simulations conducted by the Air Force and other agencies show that those satellites are vulnerable to everything from missiles to lasers and electronic attacks. “We did a really rigorous piece of analysis on what we need to do to prevail in space,” she said. The studies concluded that some missions could be transitioned to cheaper LEO systems but that doing so greatly increases the risk to military forces that depend on space-based services like missile warning and navigation. SDA director Fred Kennedy and his boss Mike Griffin have made it clear that the agency will not be deterred by critics, and they believe SDA deserves a chance to prove it can do things faster and better. As to whether Wilson will continue to push back, she will have another opportunity on Thursday at a hearing of the Senate Armed Services Committee where she will testify on the Pentagon’s proposal to establish a Space Force, alongside Shanahan and another senior officials. According to a DoD source, a Senate staffer asked a Pentagon official during a recent meeting: If space acquisition is so flawed that we have to create the SDA under the secretary of defense, then put it back under the Air Force when a Space Force is stood up, how does this make sense?